1) It documents choreography of a set of bunkai of the hojoundo in Uechi Ryu Karate. 2) It documents choreography of a form or kata which teaches basic kicks encountered in contemporary martial arts. 3) It is intended to be a blueprint of a process for acquisition of the ti tIe of renshi, kyoshi, and hanshi of Uechi Ryu Karate. This process is designed to be distinct and separate from that which is already in place to evaluate and award the ranks of rokudan, nanadan, and hachidan of Uechi Ryu Karate. Ever since karate has been a part of the Okinawan culture, there has been an emphasis on seniority. Only in this century has there been a structure which codified this system so precisely. The purpose of such a system is to create a hierarchy which preserves and develops the body of martial arts knowledge. The process that creates and maintains this structure is the system of tests, rankings, and titles. Ideally any administrative structure should be minimal in comparison to the body of individuals who practice karate. Such a structure cannot exist without acceptance from those who study and practice martial arts. The best guarantee of success for such a structure is to have a process that is well defined and merit ­based. Ranks in Uechi Ryu can be broken down into two major categories: kyu ranks and dan ranks. Kyu ranks are commonly thought of as a beginning phases in martial arts training. At the first dan rank (shodan), one is considered capable of teaching, although still very much a student of the martial arts. A separate seniority scale exists alongside the previous structure which is broken down into three major categories: student, instructor, and master. Although one is always a student of the martial arts, one is thought of being eligible for instructor or sensei status after achieving a dan rank. This title does not automatically come with the rank, however. Many fine technicians do not possess the understanding and skills necessary to pass the art of karate to others. Similarly one is eligible for master or shihan ranking after achieving a specific rank. Renshi is commonly awarded with rokudan, kyoshi with nanadan, and hanshi with hachidan. While the mas ter ti tIe comes separate with the rank, practically speaking they are awarded simultaneously, and no separate evaluation process exists to achieve the title “shihan”. It is the opinion of the author that shihan should be awarded to those who make a significant contribution to the art of karate that they represent. The rank of rokudan, nanadan and hachidan should be necessary but not sufficient conditions for achieving the titles of renshi, kyoshi, and hanshi respectively. This thesis is intended to establish and prime a formal process to evaluate a candidate for the shihan title. This document proposes a body of work which represents elements of the past, present, and future of practice of uechi Ryu in its surrounding element. The future is represented by an improved process which leads to the shihan title. The past and present are what the author draws from in his personal quest for shihan. 3) The strength of the Okinawans is preservation and perfection. The strength of the Chinese is years of experience in conflict and bountiful creativity. Unlike Okinawa, the Chinese readily make up forms that are customized to the individual or group of individuals being taught. At this point in time, none of the original practitioners of the forms exist. There was no need to “preserve” specific forms when new forms from the same body of knowledge were constantly being choreographed. The result of any of these scenarios is one where a single person brought a small body of knowledge over to a new culture, and it survived, evolved, and thrived into what it is today. It is difficult to believe that what we practice today is exactly like what was taught to Kanbun Uechi, if only in the interpretation of the forms Uechi practitioners practice. Kanbun carried one set of forms from an area where many similar styles were practiced. The system evolved into what it is today in the context of Okinawan karate, not Chinese kenpo. While this evolution has been good for the system, many subtle elements of what Kanbun practiced must have been lost or reinterpreted. In this context, an ambitious practitioner has several sources of “literature” to evaluate to shed light on the history and content of Uechi Ryu. 1) One can search the Foujou area of China in hopes of finding the “source of the Nile”. 2) One can study other relatively “pure” Chinese systems that have come from Foujou province and evaluate interpretations and techniques that fit with the present body of knowledge called Uechi Ryu. 3) One can study other sanchin based systems and draw from the experience and interpretations of others who helped this family of systems evolve in the culture of Okinawa. For mostly practical reasons, the author has chosen the latter two paths. One of the truly positive things that the Naha area of Okinawa has contributed to its martial arts systems is its bunkai and yakusoku kumites. These exercises seek to offer interpretations of the kata, and they give a practitioner experience in applying these carefully choreographed interpretations with a partner. In today’s Hollywood environment of point tournaments and professional contact fighting wi th their rules that emphasize superficial drama and athleticism, these partner exercises are a precious effort to preserve the meaning and dignity of the original styles. In Uechi Ryu, the bunkai and yakusoku kumites represent Kanei Uechi’s interpretation of these forms. In some cases, one can see where these represent uniquely Okinawan interpretations. For instance, one could argue that the Seisan bunkai interpretation of the jump as an escape from a sword attack is strictly in the Japanese context. The Chinese technique of “iron broom” wi th its double leg sweep was much more likely encountered by an average Chinese kenpo practitioner, and so the Seisan jump would be much more practical-and more likely to succeed-in that context. 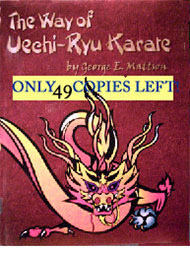 The author’s first exposure to martial arts was through Japanese Shorin Ryu. After transitioning to Uechi Ryu, the author studied Okinawan Shorei Kai Goju Ryu (5): a system softer than the better known Yamaguchi interpretations of Goju. This system was taught to the author with a bunkai for every kata except Sanchin. A few of the bunkai were choreographed by the instructor, Steven King, who was formerly in the Green Beret and has years of combat experience. 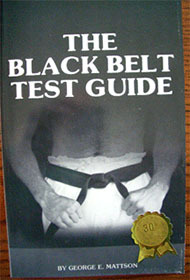 The author also studied the Tomiki method of Aikido from Steven King. In addition the author studied several books (1,4) and a videotape (3) of Wing Chun, a well known system from Foujou province with three forms, shallow stances, an principles similar to Uechi Ryu. It was the author’s intention to teach the collective experience from these studies to his Uechi Ryu students. However the more efficient and practical way to convey the knowledge was to do it in the context of Uechi Ryu and its Sanchin principles. One result is the set of bunkai choreographed for the hojoundo of Uechi-Ryu. These rules create an environment that encourages kicks, especially high kicks. Such techniques, if they find their target, can be devastating. A martial artist must do more than find defenses to counter his/her own offense. One must strive to develop defensive methods to counter the prevailing offensive techniques. In a Taekwondo class, one is stripped of the very best defenses that the Uechi student has against such attacks: infighting, sweeps, leg kicks, grabbing, and throws. AdditionallY, the typical Taekwondo student does not develop the leg conditioning and the falling capabilities to survive such measures, even in a controlled sparring environment. Thus the best way to develop these counter measures is to bring the Taekwondo techniques into the Uechi environment. Doing the typical Taekwondo kicking techniques seems anathema to the principles of Uechi Ryu. The groin is often exposed. The back is frequently turned to one’s opponent. Many poorly trained Taekwondoists do “flicking” kicks. For example, a typical front kick seen outside a Uechi class starts with the knee raised to a point facing the target, and then the quadriceps muscle is contracted. This results is a motion similar to that used to kick a football; a motion inappropriate for use against a vertical surface. Just as this Chinese style renamed Uechi Ryu changed as it progressed from China to Okinawa to the United States, so Taekwondo kicks must change as they are practiced by those who kick conservatively and with defense in mind. We learn by bringing the best of one’s opponents to the table, not by being easy victims to each other. Much of the author’s original kicking ability was developed in Shorin Ryu karate, the author’s first style. Shorin Ryu is often thought to be the root of many modern karate styles. One is hard pressed to find real differences between the beginning forms in Shorin Ryu, Shotokan, and Taekwondo. The authors kicking ability was expanded by being exposed to talented practitioners of Taekwondo and Hapkido. Finally his portfolio was refined by work with Ray Berry, a talented Shotokan instructor with a single technique emphasis. At one point the author felt a need to bring this kicking knowledge to his students. He took a ten kicking technique routine taught by Hiroshi Hamada and used it in his regular instruction. As time progressed, the author felt a need to introduce more kicks, more stances, and more combinations. The original Shorin Ryu techniques were supplemented by a typical Korean kicking combination: the round house and spinning hook kick. The author added these techniques to the ten technique form, added a “mirror image” section, and a one technique transition. The resultant 25 technique form was called “Two Bi ts”. After about a year of experience with students practicing the form, the author felt a need to add some stances and techniques typical to the Uechi practitioner. Sanchin, cat, and crane stances were added. Front snap kicks were added to the repertoire of front thrust kicks, and taught as two distinctly different techniques. A favorite technique of a Uechi sparring champion, Shinjo Kiyohide, was added: the spinning back/side kick. The form finishes with a Hollywood style reverse crescent/ax kick-just for fun. These new techniques were added to both mirror sides of the form. The resulting form became thirty eight techniques long. The author asked his university of virginia karate students to label the form. The students named it “Thirty Eight Special”, a reference more to a popular band of that time period than to the well known firearm. In an effort to be certain that the karate kicks were done with an emphasis on street effectiveness and classroom precision, a series of warm up drills were added to the U.Va. class repertoire. These techniques were borrowed from Ray Berry’s instructor, master Oshima, and from some Goju Ryu karate routines. The result is a form that demonstrates quality in content and execution. This section documents the specific techniques of the hojoundo bunkai. In order to fully appreciate the content of the individual routines, it is vital to understand a few of the underlying principles of the routines. The author felt the need to give perspective on the actual application of the hojoundo techniques. Relying on sparring alone is inadequate as the kara teka inevi tably resorts to techniques which maximizes one’s ability to play this sophisticated game of tag. The best way to have someone assimilate these techniques as applications is to create exercises that utilize the techniques with a partner in a context more realistic than point sparring. The author had no intention of repeating the “prevailing wisdom” in the bunkai he created. This would just give another collection of techniques that the overburdened student needed to learn-only to reinforce the same material. Whenever possible the author intentionally chose different applications for the movements being studied. This approach was not designed to negate applications from other bunkai and kumite. Rather this reinforces the idea that a good technique teaches a principle that can be applied in many unique situations. 1) The continuous, repetitious sequence of techniques is designed to invoke mushin in the same fashion that the repetition in sanchin kata does. It is the author’s opinion that developing this state of mind while executing technique both aids in technique assimilation and enhances the practi tioner’ s abili ty to invoke this vi tal state of mind when performing under stress. 2) The complete complement of defensive motions in the bunkai is designed to emphasize the author’s Platonic ideal of a world where no harm comes of the karate practi tioner. It is a perfect world that we always come closer to, but never reach. It also emphasizes the joy of practice for two superbly trained karateka. Everyone of the bunkai is designed to be done from both left and right starting stances, just as the original hojoundo bunkai are. This develops ambidexterity in application as in exercise. The obvious benefit is doubling the compliment of techniques that the practitioner can perform. 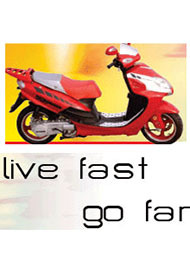 It also gives physical balance for those interested in personal physical development. In addition to the obvious direct benefits of ambidextrous training, some health researchers claim that those that practice doing activities of normal living (writing, eating, etc.) with both sides recover more quickly from debilitating strokes. The ambidextrous brain has a broader compliment of synaptic pathways to achieve its “rewiring” process during rehabilitative therapy. This also suggests subtle enhanced capabilities for the healthy brain. The individual accustomed to traditional partner exercises will find the footwork in these bunkai to be somewhat “unconventional” and difficul t to learn. Actually the author attempted to use sliding steps in lieu of the traditional full steps used in most Okinawan karate prearranged kumite. The author felt it important to introduce stepping which was more like that done naturally in actual fighting. The author also places a great emphasis on fluency in legwork. Thus new and unconventional foot work is also an attempt to broaden the students understanding of karate application. Sanseirui’s preponderance of turns, steps and varied stances is a testament to the value that the author of Uechi Karate placed on good footwork. Finally, the author attempted to make the bunkai as similar to the original hojoundo as possible. When learning these sequences, it is important to remind oneself of this often. The goal is to reinforce existing information-not create more material to learn. There are some exceptions to this rule of thumb. These exceptions are there either because the original sequence was difficult to interpret literally or because an expansion of the concept of a particular hojoundo brought great value to the exercise. The partitioning of these bunkai into three separate levels is a reflection of the level of difficulty of the techniques. It also is an attempt to avoid overwhelming a student with too much procedural learning at one time. The primary value, after all, begins after the student can practice the routine without hesitation. The attacks in this sequence are traditional Okinawan karate attacks for a prearranged exercise. However the defense is designed to keep the practitioner in the same stance: just as is done in the actual hojoundo routine. The beginner is encouraged to practice the defensive routine exactly as written. After comfortable with the sequence, one will find the kicks easier to place on the opponent if one does a lateral step on the first wauke defense, and a diagonal step back on the second wauke defense. Full step forward to right sanchin, right middle punch. Sliding step back, right lower block. Sliding step back, left lower block. Left front snap kick, go back to left Sanchin. The practitioners will find that they are both doing the same set of techniques, but one individual will be a single technique out of phase from the other. The practitioners are encouraged to develop minimal movement wi th the blocks-particularly wi th the palm blocks. Sliding step forward, right punch. Sliding step back, left wauke. Sliding step back, left palm block. Most of the hojoundo bunkai are almost exactly like the original exercise. An original bunkai choreographed by the author proved to be awkward and of little practical consequence. The following exercise was suggested by Bruce Hirabayashi after about a year of practice of the original bunkai. Sequentially it is different from the exercise, but all of the elements are there. Many students feel a need to be extremely physical with individual techniques in prearranged kumite. While this allows one to be competitive, it draws the student away from what a realistic exchange is like. The following sequence should be practiced with speed and fluidity, not with knockout power for each punch. The attacks should be viewed as triplets; the defender must move quickly and smoothly from block to block. The two middle blocks at the end of the sequence are both inside, and consequently quite difficult to perform. The attacker should cooperate by throwing straight, middle area punches. The defender should use the unoccupied hand as a backup for sloppy or hooking punches. high right punch, middle left punch, middle right punch. high left punch, middle right punch, middle left punch. high right forearm block, middle right forearm block, middle right forearm block. high left forearm block, middle left forearm block, middle left forearm block. high right forearm block, middle left forearm block, middle left forearm block. Full step forward to right Sanchin. The following bunkai is actually a hybrid of the eye strike and wrist block hojoundo. Counter to the normal convention, the attacker applies the studied technique. The defender uses the chi sao or sticking hands from Wing Chun to follow the attackers’ deflection of the arms, and block when the threat to the face is felt. The irony of the sequence is that, when the defender’s arms are as long as the attacker’s, the defender finishes with the ability to deliver the very technique that he/she was attacked with. Siding step forward, scoop partner’s hands down and towards you. Yield arms softly, but maintain center and stick to partner’s arms. As you feel the upward motion towards your face, perform a double upward wrist block towards partner’s face. As you feel the upward motion towards your face, perf orm a double upward wrist block towards partner’s face. Continue circular motion to a double eye strike to partner. The following is a classic application of the crane system, both for the person avoiding the strike at or near the knee and for the person delivering a side kick that could be interpreted as a take-down. It is rare for a karateka to practice an application which puts the knee so much in jeopardy. This is what separates sport karate from classical martial arts. Step forward into right Uechi horse stance, perform right middle punch. Perform first half of seisan jump into right crane stance to remove grip from arm and avoid kick to knee. Lower right leg into right sanchin. Step forward into left Uechi horse stance, perform left middle punch. Perform first half of seisan jump into left crane stance to remove grip from arm and avoid kick to knee. Sliding step back, right wauke. LIGHTLY grab onto partner’s right arm. Right Uechi side kick either to partner’s right knee to strike knee, or grazing right thigh to perform takedown. Bring right leg back to left sanchin. Sliding step back, left wauke. LIGHTLY grab onto partner’s left arm. Left Uechi side kick either to partner’s left knee to strike knee, or grazing left thigh to perform takedown. Bring left leg back to left sanchin. The author spent part of a year training with the Charlottesville Boxing Club in 1976. The head of the club taught a defensive technique for the roundhouse punch that he called “answering the telephone”. The author immediately recognized that the motion was similar to the raised arm position in the seisan jump. From that point on, the author chose to execute the right arm technique in a manner that reflects this defensive application. Ironically enough, the author noted that NAC began emphasizing this position fifteen years later. The author has not yet seen a similar application among other Uechi practitioners. Sliding step forward, middle punch. Sliding step back, left “answer the telephone” block. Sliding step forward, right middle punch. Sliding step back, right “answer the telephone” block. Sliding step forward, right roundhouse punch to temple. Sliding step back, right wauke. Sliding step forward, left roundhouse punch to temple. This sequence is similar to the shomen zuki bunkai in that the two partners apply the same techniques, but out of phase from each other. The original hojoundo is expanded by two techniques. The most significant aspect of the bunkai is that it applies the Uechi elbow technique like a Wing Chun elbow-up block. This sequence adds to the repertoire of sticking hand applications and offers a broader understanding of what the elbow technique means. A natural extension of the elbow block is to follow with a back fist-similar to a sequence in the Sil Lim Tao form in Wing Chun. Sliding step forward, left middle punch while chambering right fist. Right middle punch while withdrawing left arm to sanchin. This bunkai applies the other three wrist movement from the wrist technique exercise not applied in the shomen hajiki bunkai. The original attack is straight out of Seisan. The bunkai emphasizes that these techniques are both blocks and strikes. Sliding step forward, double ridge hands to temples. Double wrist strikes down and forward, outside heel of hand finishing on inside of partner’s elbows. Sliding step back, double outside wrist blocks. Double inside wrist strikes to throat. This bunkai is similar in style to a typical bunkai in the Shorei Kai Goju Ryu system. The front elbow strike is done in the kata Geiki Sai, and the block is the “osei uke” , or 90 degree turn with palm check. The practice of creating an application where the original sequence jumps back and forth between the two partners is common for Okinawan Goju bunkai. The sequence can be done wi th great speed and power once both partners know the routine. Sliding step forward, left middle punch. Pivot 90 degrees to right sanchin as left arm is pulled, and “check” side of left front elbow strike with right palm. Rotate left arm counter­clockwise to escape grab, and draw arm undernea th partner’s left elbow and across your own body. Perform left side elbow strike to partner’s ribs. Pivot 90 degrees back to left sanchin while doing right palm block to right elbow strike and chambering left fist. Perform left palm-up punch to partner’s ribs. Slide back to left Sanchin. Begin right wauke while chambering left arm for front elbow strike. Hold onto partner’s left arm with partially extended right arm. Perform Seisan-style left front elbow strike while pulling right arm back to sanchin position and sliding into left “leaning” front stance. As partner is freed of right grab and sets up to do elbow strike to ribs, pivot 90 degrees to right “short” front stance and block elbow strike with a left back elbow movement. Pivot 90 degrees back to upright left front stance while performing right elbow strike to partner’s neck and chambering left fist. Drop right elbow down in left sanchin to block palm-up punch to ribs. All the tenshin applications are single opponent applications. While Kanei Uechi may have meant the tenshin movement to be one where the defender turns to a laterally approaching opponent, a more practical application is demonstrated by a common movement in aikido. The goal is to turn the corner on the attacker, ending up either at the side or the back of the opponent. Look to right, step forward to left sanchin, pivot 90 degrees to right sanchin while performing right low block. Full step forward to left sanchin, left middle punch. Look to left, step forward to right sanchin, pivot 90 degrees to left sanchin while performing left low block. Tenshin turn to right sanchin, left wauke. Right front snap kick partner’s side. Tenshin turn to left sanchin, right wauke. Left front snap partner’s side. The 270 degree turn is a necessary evil in martial arts. It is done in extreme situations, like here where the defender’s knee is in jeopardy. This move is hinted at in the kata Sanseirui where the performer turns 225 degrees from a SW facing right horse stance to a N facing left sanchin. One needs to “spot” the attacker in the same fashion that a spinning dancer “spots” an arbitrary point in space. 270 degree counterclockwise turn to left sanchin, pivoting on left foot. Tenshin turn to right sanchin while performing left wauke. Left Uechi side snap kick to partner’s left knee, step forward to left sanchin. Right Uechi side snap kick to partner’s right knee, step forward to right sanchin. 270 degree clockwise turn to right sanchin, pivoting on right foot. Kanei Uechi acquired the wrist blocks from Okinawan karate, and probably from Okinawan Goju Ryu. The Goju defense to the karateka executing the tenshin turn and attacking the temple from the side is a wrist block done on a plane to the side of the body. It is important for the individual applying the tenshin motion to realize that the timing of this application is very different from the exercise. The attacks (seikens instead of shokens for safety reasons) are executed before the practitioner fades away from the opponent. The goal is to have the body movement give a net positive as opposed to negative doppler-like effect to the strikes. Sliding step forward, left middle punch, draw left arm back in a high wrist block in a plane parallel to side of body, step forward to right sanchin, pivot 90 degrees to left sanchin. Sliding step forward, right middle punch, draw right arm back to sanchin position as a blocking motion, sliding step back. Full step forward to right sanchin, right middle punch, draw right elbow back as a side area block, step forward to left sanchin, pivot 90 degrees to right sanchin. Full step forward to left sanchin, left middle punch, draw left arm back to sanchin position as a blocking motion, sliding step back. Begin Tenshin turn while performing left wauke, right punch to temple before executing last two steps of Tenshin turn, finish in right Sanchin. Right wauke, left middle punch over top of partner’s right arm. Begin Tenshin turn while performing right wauke, left punch to ribs before executing last two steps of Tenshin turn, finish in left Sanchin. Left waue, right middle punch over top of partner’s left arm. The core of this form is a ten kick exercise taught in Japanese Shorin Ryu by Hiroshi Hamada. The techniques of this basic exercise are front thrust kicks, side thrust kicks, roundhouse kicks with significant hip movement, and back kicks. The stances are zenkutsu dachi (front stance) and kiba dachi (horse stance). The roundhouse, spinning hook kick, reverse crescent, and ax kick are classic Korean karate. The author picked these up from Taekwondo and Hapkido practitioners. A back stance (kokotsu dachi) is performed at the end of the ax kick to demonstrate control of weight on the rear leg and a sinking of the center to add to the kick’s power. The crescent, spinning side kick combination is generic karate. However the intent was beyond adding two more techniques. Kiyohide Shinjo used the spinning side kick as a flashy secret weapon that drew from his kicking dexterity. This spinning technique was in an older version of the Uechi dan kumite (#3), but was replaced with a simpler and “safer” combination. This combination can also illustrate the principle of Chinese “iron broom”. The defense for this double leg kick is the Seisan jump. Finally a set of techniques that could be done out of the Uechi sanchin stance, cat stance (nekko ashi dachi), and crane stance (sagi dachi) are done to add practical value from the offensive side for the Uechi karateka. These techniques include a front snap kick, a skipping front snap kick, a modified side thrust kick, and two different crane applications. The practitioner must spend as much time working on the stances as on the kicks. The form has two different levels for the center of gravity. The cat, crane, and sanchin stances are at a higher center of gravity. The front, side, horse, and back stances are done at a lower center of gravity. It is extremely important for the practitioner to transition from stance to stance with the center of gravity at the same level. Every single technique in this form has a significant hip motion. In some cases, the support leg rotates in the hip socket (front and side kicks). In some cases, the entire hip pivots on the support leg (roundhouse, crescent, and spinning kicks). In some cases, the hip has significant translational motion (skipping front kick). In some cases, the individual drops the level of the hip (ax kick). It is very important for the practitioner to study where the hip motion contributes to the power, form, and execution of each and every kick. In essence, this is like applying principles of sanchin to kicking, as sanchin teaches us how to deliver whole body power to arm strikes, blocks, steps, and turns. Warm ups are very important for both execution of and improvement in this form. All standard lower body stretching routines are appropriate. It is important for the practitioner to learn stretches that work all the different degrees of freedom of motion for the back, hip, knee, and ankle. Rotational and lateral motions are as important as the linear and major motions. The author strongly recommends that the practitioner learn a stretching technique called proprioceptive neuromuscular facili ta tion. For obvious reasons, this is abbreviated as PNF stretching. The practitioner first gets into a stretch position with good form. Then the person contracts the muscle in an isometric fashion wi th maximal effort for six to seven seconds while breathing as normally as possible, or slowly exhaling. This is followed by ten to twenty seconds of rest in the stretched posi tion. The sequence can be done two or three times if time permits. This type of stretching can be done alone, or with a good partner. This technique gives the practi tioner an active (as opposed to merely passive) range of motion. It serves to both stretch and warm the muscle. Anecdotally speaking, the author finds this type of stretching to be less likely to produce the tendon soreness that normal stretching can cause when done intensely. The author also recommends a set of exercises which warm up and develop the thrusting focus technique. There are two for the front kick, and two for the side kick. Each can be done up to ten times per side. In the first front kick exercise, the person lies on his/her back with head, arms, and legs off the floor and the entire spine touching. Then the person does a series of thrusting motions with the legs that resemble a staccato-like back peddling. In the second front kick exercise, the person stands on one leg and holds the other knee to his/her chest. The leg is thrust forward with the foot travelling parallel to the floor, and held out for a second before returning to the tucked position. It is important to rotate the support heel in on the leg extension, and rotate it back out when drawing the leg back. The practitioner should have the feeling that the support leg rotation drives the leg extension (and not the other way around). This hip motion is very kind to the kicking knee, and brings great power to the kick. In the first side kick exercise, the person starts with feet parallel. After taking a step forward with the left leg, the right knee is brought up to touch the chest (if possible). A side thrust kick is then executed down to the side and held for a second. The knee is then brought back up to the chest, and the person then steps back to the starting position. This should be done on both sides. In the second side kick exercise, the person stands on one leg and holds the other knee to his/her chest. The leg is thrust out to the side while leaning back away and rotating the support leg 90 degrees until the support heel faces the extended leg. The foot must travel parallel to the floor, and should appear to travel in a perfectly straight line when viewed by a recipient of the kick. The leg is then drawn back to the tucked position while rotating the support leg back so the heel is facing behind the person. The practitioner should have the feeling that the support leg rotation drives the leg extension (and not the other way around). As with the front kick exercise and technique, this hip motion is very kind to the kicking knee, and brings great power to the kick. Start facing N in musubi dachi. Slide left foot N into left zenkutsu dachi, facing N.
slide right foot NE into kiba dachi while turning face to NE. step right foot SE and face NW in zenkutsu dachi. step right foot NW into kiba dachi while still facing NW. step right foot W into right zenkutsu dachi. lower left foot into left sanchin dachi facing E.
draw right foot back and lower it into right nekko ashi dachi. lower right foot back down to right nekko ashi dachi. step S into left zenkutsu dachi. step S into right zenkutsu dachi. draw right foot back to left zenkutsu dachi facing S.
finish in left offensive sagi dachi facing N.
lower left foot down to left sanchin dachi facing N.
finish in right kokotsu dachi facing N.
slide left foot NW into kiba dachi while turning face to NW. step left foot SW and face NE in zenkutsu dachi. step left foot NE into kiba dachi while still facing NE. step left foot E into left zenkutsu dachi. lower right foot into right sanchin dachi facing w.
draw left foot back and lower it into left nekko ashi dachi. lower left foot back down to left nekko ashi dachi. draw left foot back to right zenkutsu dachi facing S.
finish in right offensive sagi dachi facing N.
lower right foot down to right sanchin dachi facing N.
finish in left kokotsu dachi facing N.
Draw left foot back to musubi dachi. Bow. Any creative or ambitious instructor will find unique ways to convey information, crystallize new information, or respond to perceived shortcomings or open paths. Usually this is manifested in the form of a special exercise or set of techniques done for one or several classes. When these techniques prove to be of value for instruction or personal practice, a form or routine may be choreographed. The author has developed these forms for regular use in his teaching of karate. The thirty-eight special, while a long and somewhat difficult form, is taught at about the same time that kanshiwa kata is taught. The individual kicks and stances are drilled over a period of a month, and then the form is taught in one or two lessons. The hojoundo bunkai are taught in three different sets of four. The first four are taught during kanshu kata training. The second four are taught during seichin kata training. The final four are taught during seisan kata training. One never gets good results with students unless one tests the students for what they have been taught. The U.Va. Uechi club has been testing for thirty-eight special (or its precursors) for over a decade. The hojoundo bunkai have been taught and tested for about eight years. The students uniformly love the thirty- eight special form, and consider it one of the author’s better creations. The author, in turn, finds greater value and significance in the hojoundo bunkai. The biggest complaints for the thirty- eight special comes from those wi th limi ted range of motion, but the anger is usually directed within. The biggest complaint from the thirty-eight special comes from those who have problems learning new routines. However the author noted great strides in classical sparring ability from those that took the time to learn, practice, and perfect these routines. A criticism could be made that more routines pollute a relatively simple and concise system, or take the creativity away from the practitioner. The author, who is Director of Health Care Assessment at Blue Cross/Blue Shield of Virginia, finds many of these same complaints come from physicians who resist practice guidelines in medicine. The analogy is apt. One needs as many tools and guides as possible to accomplish the task of teaching martial arts or practicing medicine. There is plenty of room for creativity as each individual student or patient is unique. However not taking advantage of work that has proven results is like practicing in automatic pilot. The results are left up to chance, and the die isn’t always cast in our favor. The author is not prepared to suggest that these forms should be adopted by all (or any) other Uechi schools. Rather each instructor must draw from whatever resources are made available. Just as there are regional medical practice guidelines due to unique geographic and socioeconomic needs, so the same holds true to different martial artists teaching in different environments. However the author is more than willing to share his own work with others if it will advance our understanding of Uechi Ryu. The future direction of development for the author will be in the area of throws and falls. Uechi Ryu is an in-fighting system wi th many opportunities for grabbing and throwing. Many aikido techniques are a natural extension of techniques executed in Uechi. Probably the single most important reason why more is not done in this area is because most Uechi students are not trained to fall. The author has implemented a program of falls in his Uechi schools, and is drawing from his aikido and Goju expertise to develop some throwing routines that may be practiced safely on most surfaces. 2. Mattson, G. E.: Uechiryu Karate Do. Brockton, MA, Peabody Publishing, Co., 1974. 3. Tan, L.: Wing Chun, The Science of In-Fighting. Hollywood, CA, World Video Enterprises, Inc., 1982. 4. Ting, L.: Wing Tsun Kuen. Hong Kong, International Wing Tsun Leung Ting Martial-Art Association, 1978. 5. Toguchi, S. : Okinawan Goj u – Ryu. Publications, Inc., 1976. 6. Westbrook, A., Ratti, 0.: Aikido and the Dynamic Sphere. Rutland, VT, Charles E. Tuttle, 1970.